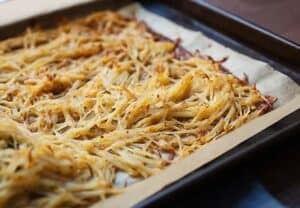 After much experimentation, here’s easiest and most failsafe way to make crispy hash browns in the oven on a single sheet pan! 1) Line a sheet pan with parchment paper and preheat oven to 400 degrees F.
2) Peel and grate potatoes until you have 4 cups (about 2 potatoes). Add the grated potatoes to a large bowl and rinse the potatoes well with cold water. Drain and rinse a second time. Drain off as much water as you can. 3) Use a few paper towels to dry off the potatoes as much as possible by rubbing the potatoes in the bowl. 4) In a microwave safe bowl, combine butter, oil, and spices. Microwave on high for 30 seconds to melt butter. Stir spice mixture into potatoes along with grated parmesan cheese. Stir well. 5) Spread potatoes out on sheet pan in a single,even layer. Some overlap is inevitable, but try to make it as even as possible. 6) Place sheet in a preheated oven on the bottom rack for 15-20 minutes. When edges of hash browns are browning nicely, move sheet pan to the very top rack. Bake for another 10-15 minutes so top can crisp up. Don’t stir the potatoes! Remove potatoes and serve immediately with other breakfast goodies! This delicious recipe was brought to you by Macheesmo. Read the full post at https://wp.me/pkSYO-djy.